Medicine Buddha: A Healer, Provider, and Protector of Both the Spiritual and Physical Realm | Sana Ako si Ricky Lee! I’ve been debating whether I’m really ready to write about the Medicine Buddha, it feels like it’s such a heavy responsibility to write about the Medicine Buddha. Although I’ve been a devotee, worshiper, follower, and an indirect disciple of the Buddha of Medicine for many years now, I still discover new things about the Buddha of Medicine everyday! One reason I included the Medicine Buddha in the WISH FULFILLING AND BUDDHA’S BLESSING MANTRA PENDANT is because I know how powerful the Medicine Buddha is. In fact, it is said that simply seeing the image of the Buddha of Medicine and His Mantra showers us with blessings. On top of that simply hearing Medicine Buddha’s name will also have some healing effect on the people who heard his name. The Buddha of Medicine’s formal name is Bhaisajyaguru Vaidurya Prabharaja, which means Master of Healing, Azure Radiance or Master of Medicine and King of Lapis Lazuli Light. He is commonly called by Tibetan Buddhist as Bhaisajyaguru, which means Medicine Buddha. Medicine Buddha is a fully enlightened being that’s devoid of any form of biased against living beings. 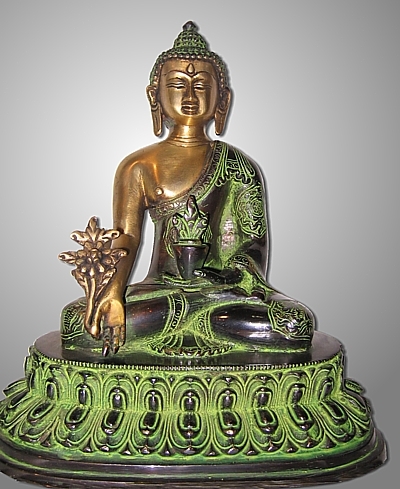 Like Avalokitesvara or Kuan Yin, the Medicine Buddha is a Buddha filled with unlimited compassion towards us. The Medicine Buddha protects all living beings from attachment; hatred; and ignorance, which Buddhists text indicates are the main cause of illness. 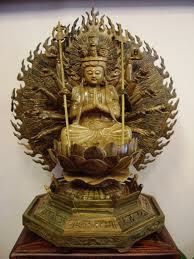 But more than that, the Buddha of Medicine also protect us from danger and negative energies or beings. There are some slight differences in how the Medicine Buddha is depicted in Tibetan Buddhism and Chinese Buddhism, however, he is usually pictured as seated on top of a lotus wearing a traditional Buddha robe, his left hand holds a lapis lazuli colored jar of medicine nectar, while his right hand holds a stem of Arura (sometimes called Aruna – a special mystical plant that is said to bloom only once in every 3,000 years) while it’s resting on his knee. In THE SUTRA OF THE MASTER OF HEALING or commonly called as the MEDICINE BUDDHA SUTRA He is also described as having a lapis lazuli-colored aura. 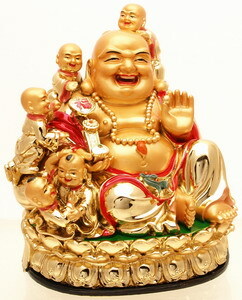 It is because of this that he is also usually depicted in Tibetan Buddhism to be a blue or lapis lazuli-colored Buddha. In essence the 12 great vows indicates that Bhaisajyaguru or Medicine Buddha is a Buddha that heals us from physical, mental, and spiritual illness. Furthermore, it also indicates that the Medicine Buddha is a Buddha of Protection and Provider Buddha. In fact, the 3rd Vow specifically indicates material wealth. Furthermore, if one is to fervently say the Medicine Buddha mantra and do the Medicine Buddha rituals, one is to be saved from the nine violent deaths. Again, in essence, the nine violent deaths refer to any form of death that may bring about extreme hardship. 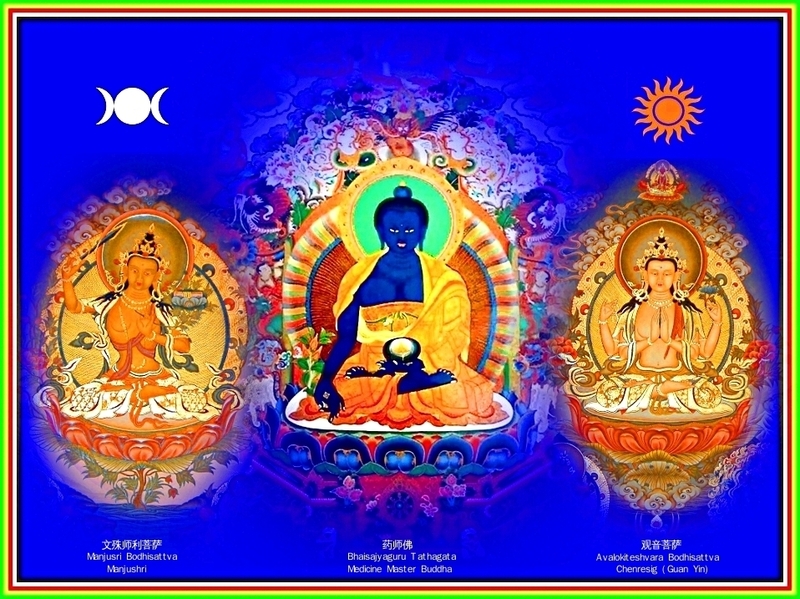 The Medicine Buddha’s short mantra is TADYATHA OM BHEKANDZYE BHAKANDZYE MAHA BHEKANDZYE BHEKANDZE RADZA SAMUGATE SOHA. Don’t be surprise to see or hear a slight variation of this mantra, which is TADYATHA OM BHEKANDZYE BHEKANDZYE MAHA BHEKANDZYE RADZA SAMUGATE SOHA. Saying the Medicine Buddha Mantra is a very powerful tool to open ourselves to the blessings of the Buddha of Medicine. However, it is better if you can say 5 full mala (108 times per full mala) in a day. It will be more ‘potent’ if you are able to say the Medicine Buddha’s long mantra. 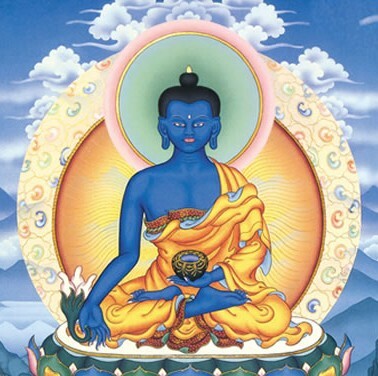 The Medicine Buddha’s long mantra is: OM NAMO BHAGWATE BHEKANDZYE / GURU BEDURYA PRABHA RADZAYA TATAGATAYA / ARHATE SAMYAKSAM BUDDHAYA / TADYATHA OM BHEKANDZYE BHEKANDZYE / MAHA BHEKANDZYE BHEKANDZYE / RADZA SAMUGATE SOHA. 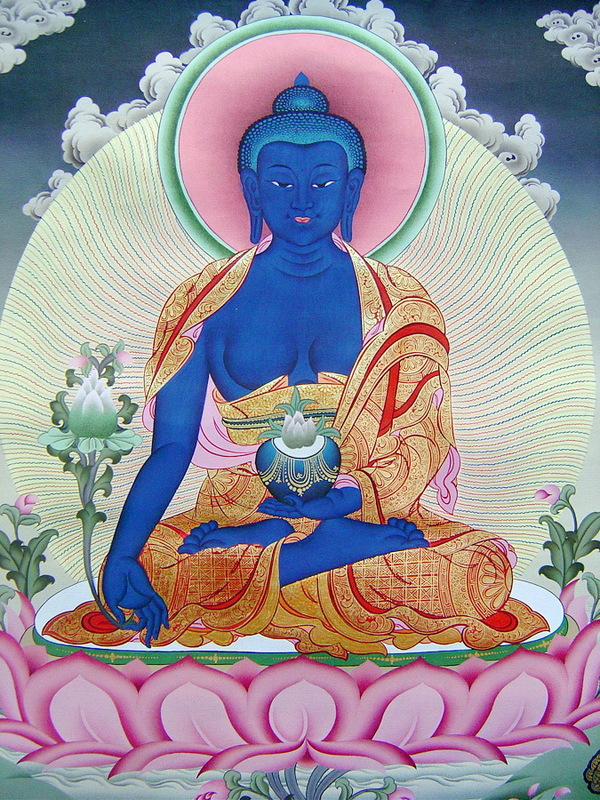 Image of Medicine Buddha with Mantra. Seeing the image and symbolic script of the Medicine Buddha has the power to bestow upon us blessings from the Buddha of Medicine. Like any mantra, seeing the symbolic script of the Medicine Buddha’s mantra is enough to grant some blessings to us from the Buddha of Medicine. Inviting the image of the Medicine Buddha inside our home will bestows upon us the blessings stated in His vows. Wearing His image and the symbolic script of the Buddha of Medicine’s mantra is like paying homage to the Medicine Buddha and also constantly tapping into His blessing. 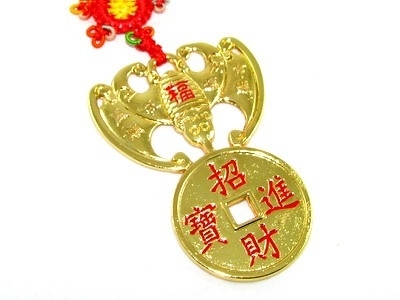 This is the primary reason why I included both His image and symbolic script in the WISH FULFILLING AND BUDDHA’S BLESSING MANTRA PENDANT,which incidentally has become quite popular amongst my readers because of the pendant’s effectiveness. I’ve been receiving a lot of emails how it helped them and I’ve blog about several of the personal testimonies. (Revised on Dec. 1, 2013). Remember though that while the Medicine Buddha’s image and mantra has the power to grant us so much blessing from Him. It will be more auspicious if one can read His sutra everyday. This is another version of the image of the Buddha of Medicine. Notice while He is not pictured year as a lapiz lazuli-colored Buddha, He still has the Buddha robe, the jar, and the plant. Allow me to briefly discuss what is a sutra. Sutras are mostly canonical Buddhist scriptures of which are mostly recorded oral teachings of the Historical Buddha Sakyamuni or Gautama Buddha. A Sutra is like the Christian Bible, but the difference is for Buddhist, they believe that simply carrying a copy of a Sutra bestows upon us the blessings of the Buddha referred in the specific Sutra. Furthermore, reading a Sutra is like praying to the Buddha. I always make it a point to read the Medicine Buddha Sutra at least once a day. I have a copy of the Medicine Buddha Sutra in my bag, in my car, and in my bedroom. You can read the Medicine Buddha Sutra in English, but do try to get a miniature copy of the Sutra and carry it with you everyday. Writing about the Medicine Buddha, His miracles, what He stands for without sharing His sutra is unacceptable. So please do allow me to share with you the Medicine Buddha Sutra as translated during the Torng Dynasty by Tripitaka Master Yiun-Tzorng. Thus I have heard. At one time the Bhagavan was travelling through various lands to teach living beings. He arrived at Vaisali [“City of Extensive Adornments”] and stayed beneath a tree from which music resounded. With him were eight thousand great Bhikshus and thirty-six thousand Bodhisattvas Mahasattvas; also kings, ministers, Brahmans, lay disciples; gods, dragons, and the rest of the eightfold division; beings both human and non-human. The immeasurable great multitude respectfully surrounded him, and he spoke Dharma for them. The Buddha told Manjusri, “Passing from here to the east, beyond Buddhalands numerous as the sand grains in ten Ganges rivers, is a world called ‘Pure Vaidurya’. The Buddha there is named Medicine Master Vaidurya Light Tathagata, Of Proper and Equal Enlightenment, Perfect in Understanding and Practice, Well Gone One, One who Understands the World, Supreme Lord, Regulating Hero, Teacher of Gods and Humans, Buddha, Bhagavan. 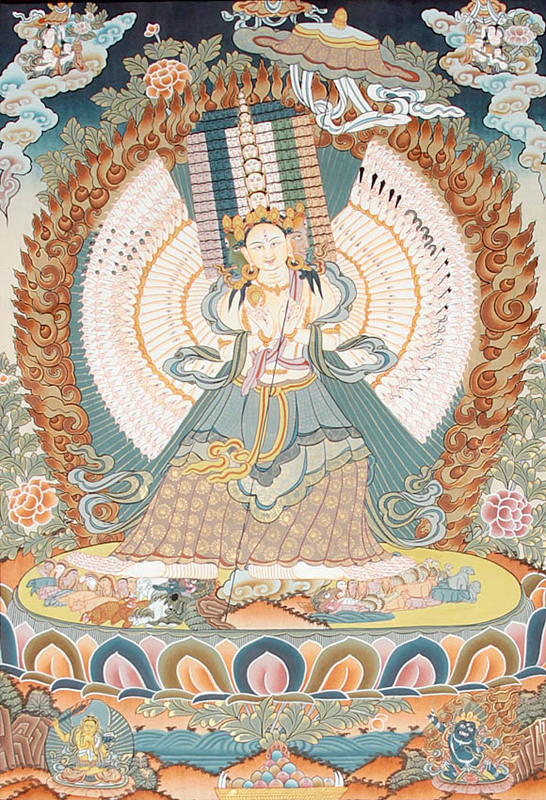 Manjusri, when that World Honored One, Medicine Master Vaidurya Light Tathagata, was practicing the Bodhisattva path in the past, he made twelve great vows that enable all sentient beings to obtain what they seek. 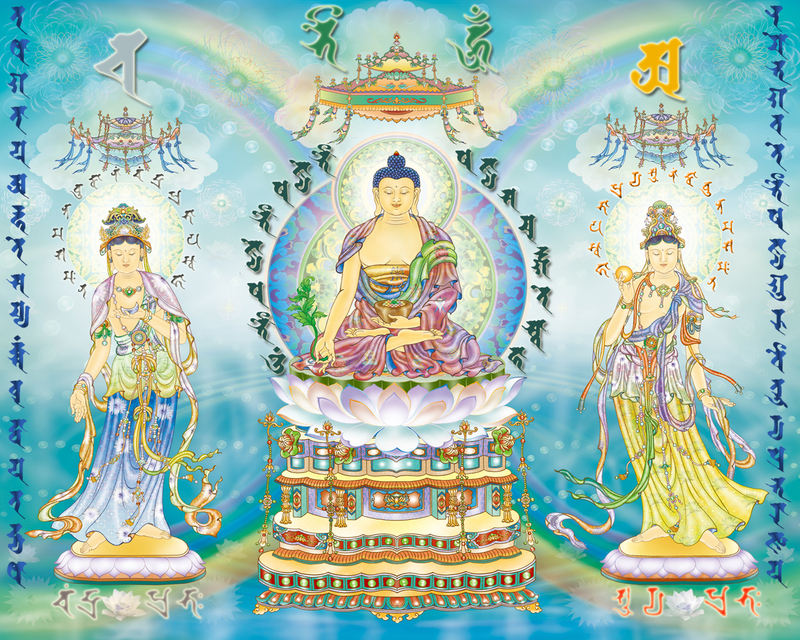 “Manjusri, these are the twelve sublime and wonderful vows that the World Honored One, Medicine Master Vaidurya Light Tathagata, One of Proper and Equal Enlightenment, made while cultivating the Bodhisattva Way. “Moreover, Manjusri, if I were to speak for an eon or more about the great vows made by the World Honored One, Medicine Master Vaidurya Light Tathagata, when he practiced the Bodhisattva Way and about the merit, virtue, and adornments of his Buddhaland, I could not finish. “That Buddhaland has always been completely pure; there are no women, no evil destinies, and no sounds of suffering. The ground is made of vaidurya, with golden cords lining the roads. The city walls, towers, palace pavilions, studios, windows, and latticework are all made of the seven treasures. The merit, virtue, and adornments of this land are identical to those of the Western Land of Ultimate miss. At that time, the World Honored One again spoke to the Pure Youth Manjusri saying, “Manjusri, there are living beings who don’t distinguish good from evil, who indulge in greed and stinginess, and who know nothing of giving or its rewards. They are stupid, ignorant, and lack the foundation of faith. They accumulate much wealth and many treasures and ardently guard them. When they see a beggar coming, they feel displeased. When they have to practice an act of charity that does not benefit themselves, they feel as though they were cutting a piece of flesh from their body, and they suffer deep and painful regret. “There are other innumerable avaricious and miserly living beings who hoard money and necessities that they don’t use even for themselves, how much less for their parents, wives, or servants, or for beggars! 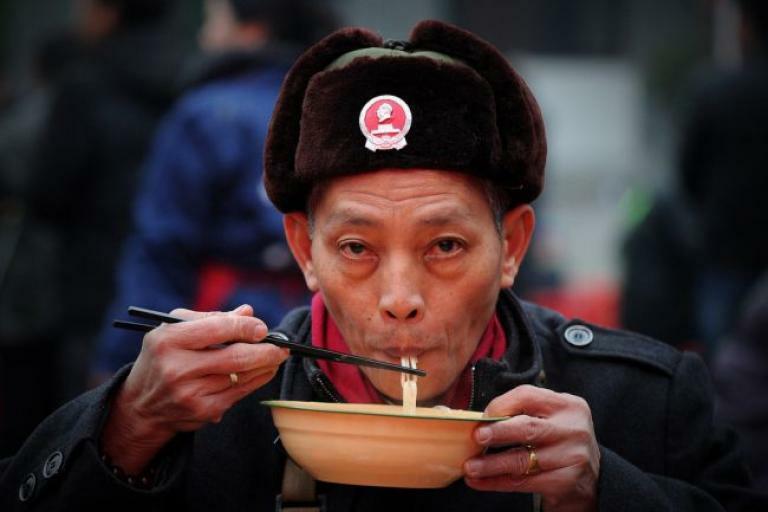 At the end of heir lives, such beings will be reborn among the hungry ghosts or animals. If they heard the name of that Buddha, Medicine Master Vaidurya Light Tathagata, in their former human existence, and they recall that Tathagata’s name for the briefest moment while they are in the evil destinies, they will immediately be reborn in the human realm. Moreover, they will remember their past lives and will dread the sufferings of the evil destinies. They will not delight in worldly pleasures, but will rejoice in giving and praise others who give. They will not begrudge giving whatever they have. Gradually, to those who come to beg, they will be able to give away their own head, eyes, hands, feet, and even their entire body, to say nothing of their money and property! “Moreover, Manjusri, there are beings who, although they study under the Tathagata, nonetheless violate the sila. Others, although they do not violate the sila, nonetheless transgress the rules and regulations. 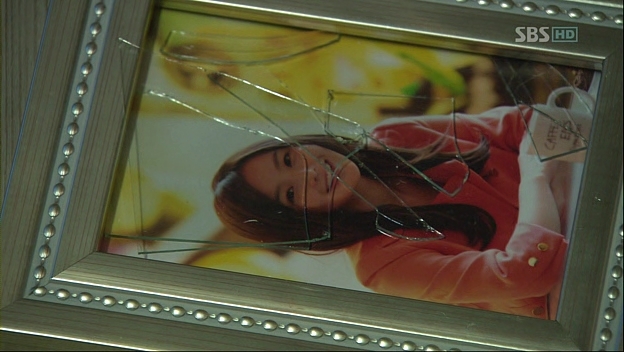 Others, although they do not violate the sila or rules and regulations, nonetheless destroy their own proper views. Others, although they do not destroy their own proper views, nonetheless neglect learning, so they are unable to understand the profound meaning of the sutras that the Buddha speaks. Others, although they are learned, nonetheless give rise to overweening pride, Shadowed by overweening pride, they justify themselves and disparage others, slander the proper Dharma, and join the retinue of demons. “Such fools act on their misguided views and further, a cause immeasurable minions of beings to fall into pits of great danger. These beings will drift endlessly in the realms of the hells, the animals, and the ghosts. But if they hear the name of Medicine Master Vaidurya Light Tathagata, they will be able to renounce their evil practices and cultivate wholesome Dharma, and thereby avoid falling into the evil destinies. If those who have fallen into the evil destinies because they could not renounce their evil practices and cultivate wholesome Dharmas, by the awesome power of the past vows of that Tathagata, get to hear his name for only a moment, then after they pass out of that existence, they will be reborn again as human beings. They will hold proper views and will be ever vigorous. Their minds will be well regulated and joyful, enabling them to renounce their families and leave the householder’s life-They will take up and maintain study of the Tathagatas, Dharma without any violation. They will have proper views and erudition; they will understand profound meanings and yet be free from overweening pride. They will not slander the proper Dharma and will never join the ranks of demons. They will progressively cultivate the practices of Bodhisattvas and will soon bring them to perfection. “Moreover, Manjusri, if there are sentient beings who harbor stinginess, greed, and jealousy who praise them- selves and disparage others, they will fallinto the three evil destinies for countless thousands of years where they will undergo intense suffering. After undergoing intense suffering, at the end of their lives they will be born in the world as oxen, horses, camels, and donkeys that are constantly beaten, afflicted by thirst and hunger, and made to carry heavy burdens along the roads. Or they may be reborn among lowly people, as slaves or servants who are always ordered around by others and who never for a moment feel at ease. “If such beings, in their former lives as humans, heard the name of the World Honored One, Medicine Master Vaidurya Light Tathagata, and by this good cause are able to remember it and sincerely take refuge with that Buddha, then, by means of the Buddha’s spiritual power, they will be liberated from all sufferings. They will be endowed with keen faculties, and they will be wise and erudite. They will always seek the supreme Dharmas and encounter good friends. They will eternally sever the nets of demons and smash the shell of ignorance. They will dry up the river of afflictions and be liberated from birth, old age, sickness, death, anxiety, grief, suffering, and vexation. “Moreover, Manjusri, there may be beings who delight in perversity and engage in legal disputes, bringing trouble to others as well as themselves. In their actions, speech, and thought, they create ever-increasing amounts of evil karma. Never willing to benefit and forgive others, they scheme to harm one another instead. They pray to the spirits of the mountain forests, trees, and graves. They kill living beings in order to make sacrifices of blood and flesh to the yaksa and raksasa ghosts. They write down the names of their enemies and make images of them, and then they hex those names and images with evil mantras. They summon paralysis ghosts, cast hexes, or command corpse-raising ghosts to kill or injure their enemies. “However, if the victims hear the name of Medicine Master Vaidurya Light Tathagata, then all those evil things will lose their power to do harm. The evildoers will become kind to one another. They will attain benefit, peace, and happiness and no longer cherish thoughts of malice, affliction, or enmity. Everyone will rejoice and feel content with what they have. Instead of encroaching upon each other, they will seek to benefit one another. “Moreover, Manjusri, there may be those among the fourfold assembly of Bhikshus, Bhikshunis, Upasakas and Upasikas, as well as other good men and women of pure faith, who accept and uphold the eight precepts either for one year or for three months, practicing and studying them. with these good roots, they may vow to be born in the Western Land of Ultimate Bliss where the Buddha of limitless Life dwells, to hear the Proper Dharma, but their resolve may not be firm. However, if they hear the name of the World Honored One, Medicine Master Vaidurya Light Tathagata, then as the end of their lives draws near, before them will appear eight great Bodhisattvas, whose names are: Manjusri Bodhisattva, The Bodhisattva Who Observes the Sounds of the World, Great Strength Bodhisattva, Inexhaustible Intention Bodhisattva, Jewelled Udumbara Flower Bodhisattva, Medicine King Bodhisattva, Medicine Superior Bodhisattva, and Maitreya Bodhisattva. Those eight great Bodhisattvas will appear in space to show them the way, and they will naturally be born by transformation in that land, amid precious flowers of a myriad colors. “Or they may be born in the heavens due to this cause. Although reborn in the heavens, their original good roots will not be exhausted and so they will not fall into the evildestinies again. when their life in the heavens ends, they will be born among people again. They may be wheel-turning kings, reigning over the four continents with awesome virtue and ease, bringing uncountable hundreds of thousands of living beings to abide in the practice of the ten good deeds. Or they may be born as Ksatriyas, Brahmans, laymen, or sons of honorable families. They will be wealthy, with storehouses filled to overflowing. Handsome in appearance, they will be surrounded by a great retinue of relatives. They will be intelligent and wise, courageous and valiant, like great and awesome knights. If a woman hears the name of the World Honored One, Medicine Master Vaidurya Light Tathagata, and sincerely cherishes it, in the future she will never again be born as a female. “Manjusri, if you see a man (or a woman) who is ill you should single-mindedly and frequently clean and bathe him and rinse his mouth-Provide him with food, medicine, or water that is free of insects, over any of which the dharani has been recited 108 times. After the sick person has taken it, all his sicknesses and sufferings will be gone. I f this person has a wish, he should recite this mantra with utmost sincerity. Then he will obtain whatever he wished for, and his life will be prolonged and free from illness-At the end of his life, he will be reborn in that Buddha’s land. He will become irreversible and will ultimately attain Bodhi. Therefore, Manjusri, if there are men and women who, with utmost sincerity, diligently worship and make offerings to Medicine Master Vaidurya Light Tathagata, they should always recite this mantra and never forget it. At that time, the Pure youth Manjusri said to the Buddha, ‘World Honored One, I vow that in the Dharma- Image Age, using various expedient means, I shall enable good men and women of pure faith to hear the name of the World Honored One, Medicine Master Vaidurya Light Tathagata. Even during their sleep, I will awaken them with this Buddha’s name. “World Honored One, there may be those who accept and uphold this Sutra, read and recite it, explain its meanings for others, write it out themselves, or tell others to write it out. They may revere it by making offerings of various flowers, paste incense, powdered incense, stick incense, flower garlands, necklaces, banners, canopies, and music. They may make bags of five-colored thread in which to keep the Sutra. They may sweep clean a place and arrange a high altar on which to place this Sutra. At that time, the Four Heavenly Kings with their retinues and other innumerable hundreds of thousands of gods will come to that place to worship and protect it. The Buddha told Manjusri, “So it is, so it is! It is exactly as you say. Manjusri, if there are good men and women of pure faith who wish to make offerings to that world Honored One, Medicine Master Vaidurya Light Tathagata, they should first make an image of that Buddha and arrange a pure and clean dais on which to place the image. Then they should strew all kinds of flowers, burn various incenses, and adorn the place with a variety of banners and streamers. For seven days and seven nights they should hold the eight precepts and eat pure food. Having bathed until clean and fragrant, they should put on clean clothes. Their minds should be undefiled, without thoughts of anger and malice. Toward all sentient beings, they should cherish thoughts of benevolence, peace, kindness, compassion, joy, giving, and equanimity. “Playing musical instruments and singing praises, they should circumambulate to the right of the Buddha’s image. Moreover, they should recall the merit and virtue of that Tathagata’s past vows. They should read and recite this Sutra, ponder its meaning, and lecture on and explain it. Then they will obtain whatever they seek: Those who seek long life will attain longevity; those who seek wealth will gain wealth; those who seek an official position will obtain it; and those who seek a son or a daughter will have one. “Moreover, if a person who suddenly has nightmare, sees ill omens, notices strange birds flocking together, or perceives many uncanny events in his dwelling can worship and make offerings of many fine things to that World Honored One, Medicine Master Vaidurya Light Tathagata, then the nightmares, ill omens, and inauspicious things will disappear and will no longer trouble him. “When a person is endangered by water, fire, knives, or poison; or finds himself on a steep cliff or in a dangerous place; or faces fierce elephants, lions, tigers, wolves, bears, poisonous snakes, scorpions, centipedes, millipedes, mosquitoes, gnats, or other frightful things, if he can single-mindedly recollect, worship, and make offerings to that Buddha, he will be liberated from all those frightful things. When other countries invade or when there are thieves or riots, if a person can recollect and worship that Tathagata, then he will be free of all of these as well. “Moreover, Manjusri, there may be good men and women of pure faith who, all their lives, do not worship other gods, but single-mindedly take refuge with the Buddha, the Dharma, and the Sangha. They accept and uphold precepts, such as the five precepts, the ten precepts, the four hundred precepts of a Bodhisattva, the two hundred and fifty precepts of a Bhikshu, or the five hundred precepts of a Bhikshuni. Perhaps they have violated some of the precepts they received and are afraid of falling into the evil destinies. If they concentrate on reciting that Buddha’s name and worship and make offerings to him, they definitely will not be reborn in the three evil destinies. “If there is a woman about to give birth who suffers great pain, if she sincerely recites his name and worships, praises, venerates, and makes offerings to that Tathagata, her sufferings will be dispelled. The newborn child will be sound and healthy, and will have upright features. Seeing him will make people happy. He will be keen and intelligent, peaceful and secure, and with few ailments, and no evil spirit will come to rob him of his vitality. At that time the World Honored One said to Ananda, “The merit and virtue of the World Honored One, Medicine Master Vaidurya Light Tathagata, which I have just extolled, is the extremely profound practice of all Buddhas. It is difficult to fathom and to comprehend. Do you believe it or not? Ananda said, “Greatly virtuous World Honored One, I have absolutely no doubts regarding the Sutras spoken by the Tathagata. why? Because all Buddhas’ karmas of body, speech, and mind are pure-World Honored One, the sun and moon could fall, wonderfully High, the king of mountains, could be toppled or shaken, but the words of the Buddhas never change. The Buddha told Ananda, “If these sentient beings hear the name of the World Honored One, Medicine Master Vaidurya Light Tathagata, and sincerely accept and uphold it without any doubts, they cannot possibly fall into the evil destinies. “Ananda, this is the extremely profound practice of all Buddhas which is difficult to believe and to understand! you should know that your ability to accept this comes from the awesome power of the Tathagata Ananda, alI Hearers, Solitarily Enlightened Ones, and the Bodhisattvas who have not yet ascended to the Grounds are incapable of believing and understanding this Dharma as it really is. Only the Bodhisattvas who are destined in one life to attain Buddhahood are capable of understanding. At that time within the assembly, a Bodhisattva Mahasattva named One who Rescues and liberates arose from his seat, bared his right shoulder, knelt with his right knee on the ground, leaned forward with his palms joined together, and said to the Buddha, “Greatly virtuous World Honored One! During the Dharma Image Age, there will be living beings afflicted with various diseases, emaciated front chronic illnesses, unable to eat or drink, their throats parched and their lips dry. Such a being sees darkness gathering all around him as the signs of death appear. While lying in bed, surrounded by his weeping parents, relatives, and friends, he sees the messengers of Yama leading his spirit before that king of justice. Every sentient being has spirits that stay with him throughout his life. They record his every deed, both good and evil, to present to Yama, the king of justice. At that time, King Yama interrogates this person in order to tally his karma and mete out judgement according to his good and evil deeds. “At that time, if the sick person’s relatives and friends, on his behalf, can take refuge with the World Honored One, Medicine Master Vaidurya Light Tathagata, and request members of the Sangha to recite this Sutra, to light seven layers of lamp, and to hang up the five colored banners for prolonging life, then it is possible for his spirit to return. As if in a dream, the person will see everything very clearly himself. 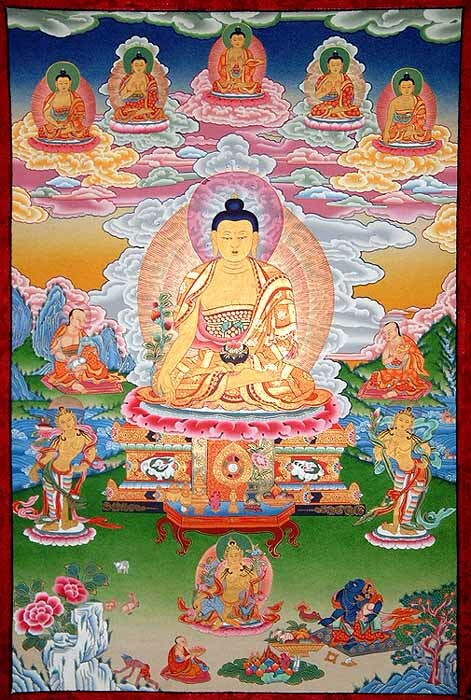 The Bodhisattva who Rescues and Liberates said, “Greatly Virtuous One, if there is a sick person who wishes to be freed from sickness and suffering, for his sake one should accept and uphold the eight precepts for seven days and seven nights, and make offerings to the Bhikshu Sangha of as many items of food, drink, and other necessities as are in his power to give. “During the six periods of the day and night one should worship, practice the Way, and make offerings to the World Honored One, Medicine Master Vaidurya Light Tathagata. 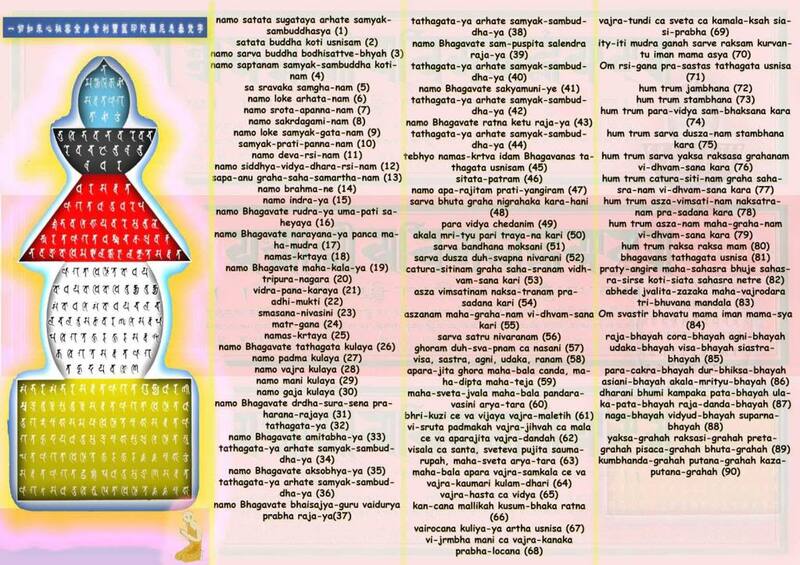 Read and recite this Sutra forty-nine times, light forty-nine lamps, and make seven images of that Tathagata. In front of each image place seven lamps, each as large as a cartwheel. These lamps must be kept burning continuously for forty-nine days. Hang up five- colored banners that are forty-nine spans long. Liberate a variety of living creatures, as many as forty-nine species. Then the sick one will be able to surmount the danger and will not suffer an untimely death or be held by evil ghosts. “Furthermore, Ananda, in the case of ksatriya princes who are due to be anointed on the crowns of their heads, at a time when calamity arises, such as pestilence among the population, invasion by foreign countries, rebellion within their territories, unusual changes in the stars, a solar or lunar eclipse, unseasonal winds and rains, or prolonged drought, those ksatriya princes should bring forth an attitude of kindness and compassion toward all sentient beings and grant amnesty to all prisoners. They should follow the above-mentioned methods to make offerings to that World Honored One, Medicine Master Vaidurya Light Tathagata. Due to these good roots and the power of that Tathagata’s past vows, the country will be safe and peaceful, the winds and rains will be timely, the crops will ripen, and all sentient beings will be blissful and free of disease. Within this country there will be no violence, nor any yaksas or other spirits that harms sentient beings, and all evil omens will vanish. “The ksatriya princes who are due to be anointed on the crowns of their heads will enjoy longer lives and good health, and they will be at ease and free from illness. Ananda, if the queens, the princes, the ministers or court counselors, the ladies of the palace, the provincial officials or the common people suffer from diseases or other difficulties, they should also hang up five-colored spiritual banners, light lamps and keep them burning, liberate living creatures, strew flowers of various colors, and burn precious incense. Then those people will be cured of their diseases and relieved of their difficulties. The Bodhisattva who Rescues and Liberates answered, “Greatly Virtuous One, did you not hear the Tathagata say that there are nine kinds of untimely death? That is why people are exhorted to make life-prolonging banners and lamps and to cultivate all kinds of blessings. Through such cultivation of blessings, they will be freed from suffering and adversity for the rest of their lives. The Bodhisattva who Rescues and liberates said, “There may be living beings who, although not seriously ill have neither medicine nor a doctor to treat them, or else they meet a doctor who gives them the wrong medicine; consequently, they meet with an untimely death. Some of them believe in worldly cults, whose deviant teachers frighten them with false prophecies. Unable to set their minds at ease, they consult oracles to find out what calamities are in store for them. In order to propitiate the spirits, they kill various creatures. 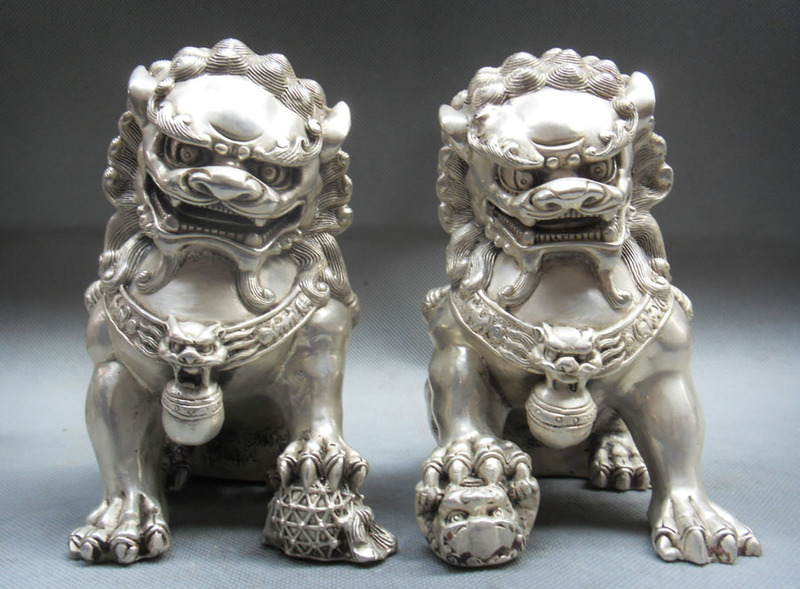 They pray to wang liang ghosts for aid and protection. Although they wish to prolong their lives, their efforts are to no avail. They deludedly hold to wrong beliefs and perverse views. Thus they meet with an untimely death and fall into the hells, never to come out. This is the first kind of untimely death. “The second kind of untimely death is to be executed at the hands of the law. The third kind is to hunt for sport, to indulge in drinking and lust, or to become excessively dissipated, and then to be waylaid by non-human beings that rob one’s essence and energy. The fourth is to be burned to death; the fifth is to drown; the sixth is to be devoured by wild beasts; the seventh is to fall from a steep cliff; the eighth is to be harmed by poison, voodoo, evil mantras, or corpse-raising ghosts; the ninth is to die from hunger and thirst. These are the nine kinds of untimely deaths generally spoken of by the Tathagata. There are also innumerable other kinds which cannot all be spoken of here. “Moreover, Ananda, King Yama keeps track of the karmic records of all the inhabitants of the world. If there are beings who are not filial to their parents, who commit the Five Rebellious Acts, who revile the Triple Jewel, who destroy the laws of the country, or who violate the precept of truthfulness, then Yama, the king of justice, examines and punishes them according to the severity of their offenses. Therefore, I encourage people to light lamps and make banners, to liberate beings and cultivate blessings so that they can overcome suffering and peril and forestall all disasters. These twelve great Yaksa generals, each with a retinue of seven thousand yaksas, simultaneously raised their voices and addressed the Buddha, “World Honored One! Today, by relying on the Buddha’s awesome power, we are able to hear the name of the World Honored One, Medicine Master Vaidurya Light Tathagata. As a result, we are no longer afraid of the evil destinies. All of us are of one mind to take refuge with the Buddha, the Dharma, and the Sangha to the end of our lives. We vow to support all living beings and to benefit them, so that they may live in peace and happiness. In whatever cities, villages, countries, or secluded forests this Sutra circulates, or wherever people accept and uphold the name of Medicine Master Vaidurya Light Tathagata and venerate and make offerings to him, we, together with our retinues, will guard and protect them, deliver them from all distress, and fulfill all their wishes. If a person wishes to dispel illnesses and difficulties, he should read or recite this Sutra and tie a five-colored thread into knots, forming the letters of our names. He should untie the knots when his wishes have been fulfilled. At that time, the World Honored One praised the great yaksa generals, saying, “Good indeed, good indeed, mighty yaksa generals! All of you who want to repay the kindness of the World Honored One, Medicine Master Vaidurya Light Tathagata, should always benefit beings and bring peace and happiness to them in this way. The Buddha told Ananda, “This teaching is called, ‘The Merit and Virtue of the Past Vows of Medicine Master Vaidurya Light Tathagata.’ It is also called ‘Twelve Spiritual Generals’ Vows to Use Spiritual Mantras to Benefit Living Beings.’ It is also called ‘Eradicating All Karmic Obstacles.’ You should uphold it in this way. ← Myth Buster 4: Bats Brings Bad Luck! There is a good Chinese Zen temple in San Juan, Greenhills where they recite the Medicine Buddha Sutra every night as part of their daily liturgy; the Medicine Buddha is one of their patron Buddhas. It is called Ocean Sky Chan Monastery. During this prayer service, everyone is welcome to attend, Filipino man o Chinese. And before the ceremony is started, you can come and have free vegetarian dinner. You can find the address online if you google it. They also offer free Zen Meditation and Buddhist recitation classes. The Buddhist monks are fully ordained from the Chinese Zen lineage (and they share the same roots as Shaolin), and is a pure and authentic Buddhist school. Thanks! Yes, I’m familiar with the said temple. I’ve visited them several time. Nice, quiet, peaceful, very Zen. 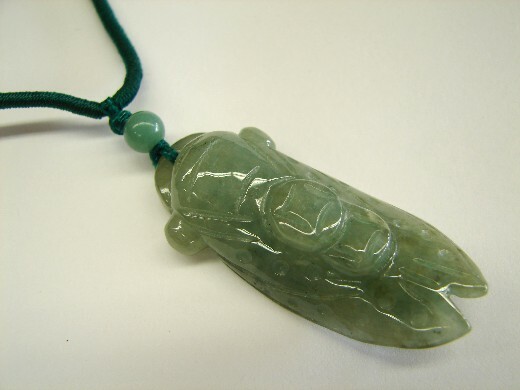 They had a bazaar once where I got a very exquisite piece of Kuan Yin pendant w/ the heart sutra. The pendant is made of real citrine. A lovely addition to the information on the internet about medicine buddha, happy mothers day! Hi, I have great love for Buddha and I had one question regarding this Sutra- the part that says ““That Buddhaland has always been completely pure; there are no women, no evil destinies, and no sounds of suffering”..does this literally mean “no women” or simply means “no lust”? Till now I believed women are treated as equal to men in buddhism and aren’t seen as being inferior – is this correct? Another area where this question comes to mind is “‘I vow that in a future life when I attain Bodhi, if there are women who give rise to a deep loathing for their female body and wish to renounce it because they are oppressed and disturbed by the myriad sufferings of being female, upon hearing my name, they will be able to turn from women into men who are replete with male features and ultimately realize unsurpassed Bodhi.” –I’m assuming this refers to freeing women from the discomforts of periods and pregnancy/giving birth? Couldn’t they be freed from these without having to change into men? I hope you are not offended by my questions but my intentions are sincere and I really do want to know what the thought process is behind these two ideas. Thanks for reading my blog. To be honest, I also had the same question before. And yes, you’re right this refers more to the discomforts of monthly period, and birth pains. We all have to understand the time in which this was written to realize the limitations of the translation. Greetings – Cheerful New Year! thank you for your wonderful blog. I am an acupuncturist in Boulder, Colorado and starting coaching. I would like to purchase the rights to the Medicine Buddha image at the top of your blog for my new website http://www.MedicineBudddhaCoaching.com. Please let me know if and how I could do this.